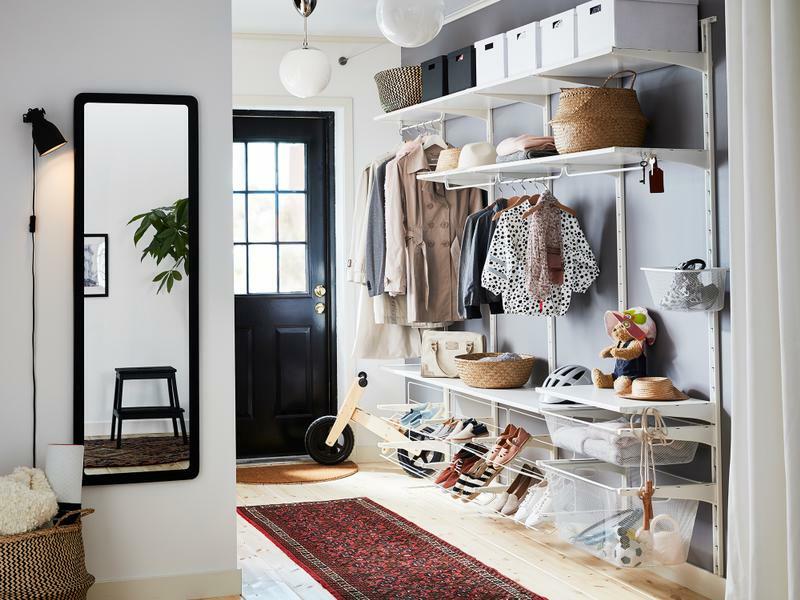 From weekly life organisation tips to solutions to keep each room in your home neat and tidy, these life hacks you are sure to be more efficient at home (and get more out of each day). Spend a little time in January setting all of the important dates in your computer and phone’s calendar for the year ahead. From when you need to have the car serviced through to birthdays and anniversaries, pop reminders in for the week ahead, and on the day, so you are well prepared for every event. Create a designated ‘landing strip’ in your entranceway for incoming and outgoing items. Think packages, store returns, and essentials you need when you go out each day like handbags, keys, sunscreen and so on. Hooks for keys, a table top for bigger items (like bags) and a box or storage solutions for papers and packages are all ideal items to keep this space neat. Keep ’emergency’ (aka handy kits of useful stuff) in key places. We’ve all wasted precious time when upstairs at home, at the office, in the car, or at a loved one’s house searching (or having to buy) those ‘just in case items’ such as scissors, tape, paper towels, umbrellas, make-up, extra kids’ outfits and so on. Reclaim wasted time this year by placing ‘just-in-case kits’ in different places like the car, office, upstairs/downstairs and your family’s homes. Start Sunday planning sessions! Taking just a little time to plan ahead of a new week (think food, appointments, activities, a list of all events everyone has on) means you’re organised and are less likely to get caught in a pickle. Help yourself by thinking about your daily routine and arranging things to suit your patterns. For example, put things where they work for you such as vitamins with your breakfast items, coffee keep cups with your handbag and headphones with your phone and keys. Sick of losing receipts and important papers? Keep a folder near the door that everyone can drop receipts (or similar papers) into as they come home. Just be sure to sort and file (or bin) every one or two months so things don’t get out of control. Mornings and being in a rush seem to go hand in hand. To keep your sanity in moments like this (and to ensure you don’t forget anything), use a morning checklist to plan out what you need to do and note anything you need to take with you each day. Create a ‘while you wait to-do list’ for all of those times you have a spare few minutes at home. Think RSVP’ing to events, writing thank you cards, filling in permission slips, creating a ‘While I wait…’ email folder and pop in all emails you need to reply to that week and create to-do notes on your phone of things you need to schedule in. Keep a basket on (or near) your coffee and dining tables so you can collect stray items throughout the day/week. This way when you’re having guests over and need to quickly clear things you just need to pop the basket out of view. Each night before bedtime, enlist the help of your family to spend five to 10 minutes clearing the clutter from living and entertaining areas. If you have little ones in the house, you can even make a game out of it and see who can pick up the most things in the timeframe. Create a tech station at one of your power sockets in a designated room and keep all chargers (phones, tablets, laptops, cameras and so on) here. Imagine the time you’ll save? Keep a duster and some spray in the living area and in between commercial breaks, wipe down your coffee table and side tables. Consider multi-tasking while watching TV and fold and iron the clean laundry. Before you leave the living room each night, fluff up your pillows and put them back into place so the lounge room looks neat and in order each day. Create a little box of bedside essentials in your beside table. Keep it stocked with pens, notepads, a torch, tissues and such things you find you need. This way if you need – or remember – something you can quickly take care of it. Make your bed as soon as you get up. This will kick-start your productivity and inclination to tidy as you go throughout the day. It also creates the feeling of a somewhat neat room to come home to each night, even if you haven’t had time to put everything else away. Keep wipes in your beside table and if you have the time, wipe your bedside tables each morning to keep the build-up of dust at bay. To keep things off the floor and as neat as possible in all living spaces (especially lounge rooms), make use of all shelves and cupboards by finding a home for everything you keep in these spaces. Think board games, books, remotes, magazines and so on. You might want to shop for baskets, trays, crates and so on to help.